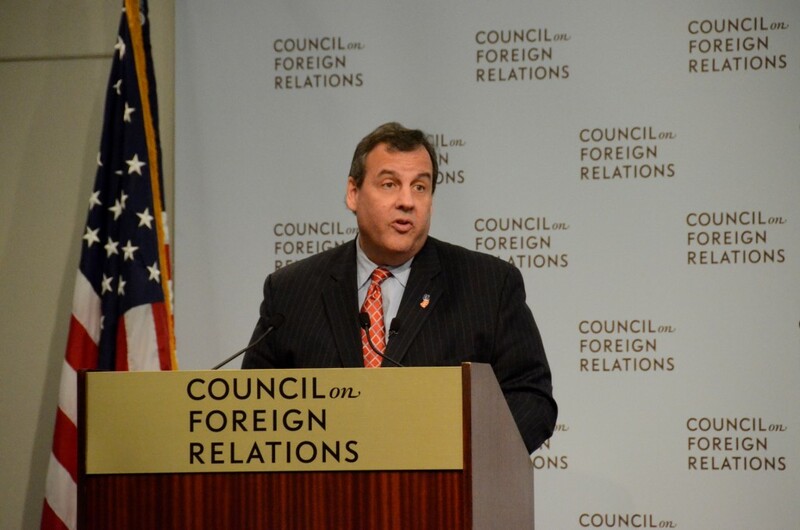 Republican presidential candidate Chris Christie talks foreign policy at the Council on Foreign Relations on Tuesday. He covered topics from the Islamic State group and Syria to trade policy and immigration. SHFWire photo by Rebecca Anzel. WASHINGTON – New Jersey Gov. Chris Christie reminded a room full of foreign policy experts of his seven years experience as a U.S. attorney in an attempt to set himself apart from the other 13 Republican presidential candidates. Speaking to the Council on Foreign Relations, he criticized President Barack Obama’s refugee program, characterization of the Islamic State group and lack of leadership and stressed the importance of preventing another domestic terrorist attack like that of Sept. 11, 2001. It is for this reason he said he is not in favor of the U.S. accepting Syrian refugees. 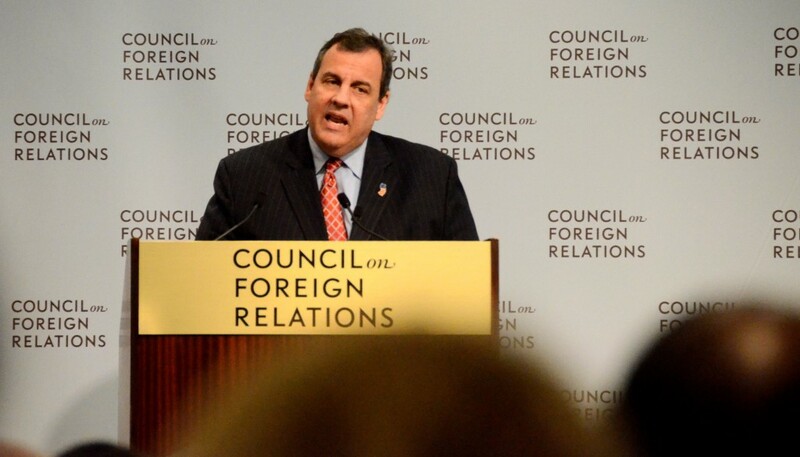 Raha Wala, senior counsel for defense and intelligence at Human Rights First, asked Christie if he would reconsider this position, citing comments made by former Department of Homeland Security secretary Michael Chertoff about the rigorous biometrics run on Syrian refugees. Wala said former secretary of State Condonleezza Rice said not taking refugees sends the wrong message. Christie was quick to point out that Chertoff and Rice are not currently in a position of responsibility “for ensuring the safety of the American people.” His position would not change, he said, until FBI Director James B. Comey says the refugee vetting process is secure. New Jersey Gov. Chris Christie says he will revisit his decision not to accept Syrian refugees in his state when FBI Director James B. Comey says the agency is able to vet them. SHFWire photo by Rebecca Anzel. Comey has opposed a bill in Congress that would require the FBI director to personally certify that refugees are not security threats. “When the FBI director stands up and says that he cannot assure the American people that Syrian refugees can be effectively vetted, that ends the conversation for the moment,” Christie said. The FBI is one of several agencies that investigates potential refugees in a process that takes up to two years. The departments of State and Homeland Security are also involved. “I would be fascinated to see the president go to Paris and speak to the families who lost their loved ones 12, 13 days ago and tell them that ISIS is just a group of killers who are good at social media,” Christie said. The fight is a personal one for him. He recounted his experience on 9/11 – worrying for his wife’s safety and what he would tell his children if anything happened to her – and the experience of one of his neighbors who died that day. Christie’s wife, Mary Pat, worked two blocks from the World Trade Center. Wall Street Journal Washington Bureau Chief Jerry Seib used Obama’s meeting with French President François Hollande at the White House Tuesday to ask Christie about American involvement against ISIS. Christie recommended diplomatic, military and intelligence operations with NATO; increased work with the U.S.’s Arab allies; and a conservative relationship with Russian President Vladamir Putin. But he also said he would warn the American public about the amount of time it will take to calm tensions in the Middle East. Christie touched on the media criticism he has received throughout his campaign, but he said he believes he can fix the American people’s wavering support of Washington. Reach reporter Rebecca Anzel at rebecca.anzel@scripps.com or 202-408-1489. SHFWire stories are free to any news organization that gives the reporter a byline and credits the SHFWire. Like the Scripps Howard Foundation Wire interns on Facebook and follow us on Twitter and Instagram. The Scripps Howard Foundation Wire originally published this piece online here.